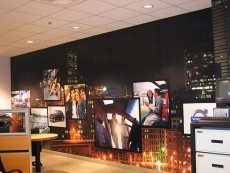 Corporate environments like lobbies, showrooms, and conference rooms can leave more lasting impressions when entire walls help tell your story. 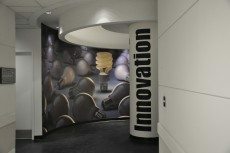 Lots of new developments in custom wall coverings – both permanent and removable, have redefined wallcoverings and interior spaces as marketing vehicles. 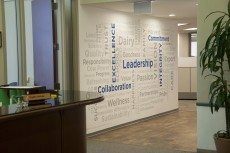 Benchmark can provide complete solutions including design, printing, and expert installation, or, just be the printing source in your supply chain. Give us a call for advice on how to find the perfect fit for your environment. 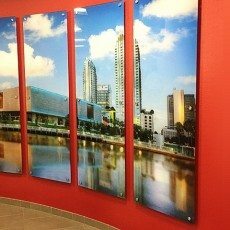 These materials match the construction specs of high quality commercial wall coverings, but can be custom printed to create a unique aesthetic in just about any commercial or healthcare environment as permanent installations that will hold up for years. 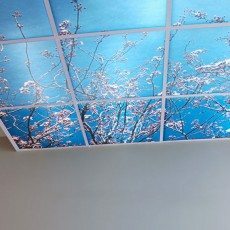 Use them to create an upscale attitude in a restaurant or a mood elevating scenic environment in a hospital. 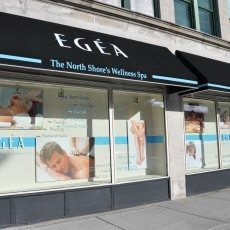 Use our liquid lamination top-coat on installed graphics for even longer life and greater durability. There are 11 surface textures to choose from. 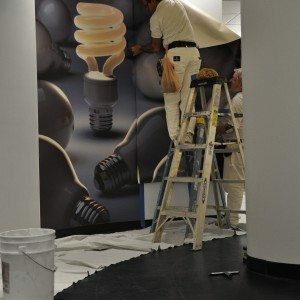 Benchmark also has a stable of excellent installers experienced with the demands of matched panel murals. 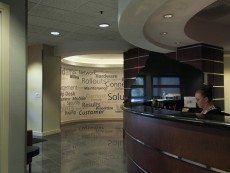 Contact a sales rep today so we can help you differentiate your facility. 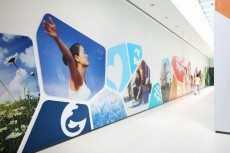 This premium alternative looks, installs, and covers like regular commercial grade wall coverings so it’s a great substitute if you’re creating full wall murals but environmental concerns make vinyl wall coverings less desirable. It has a lightly embossed textured surface and standard woven backing. 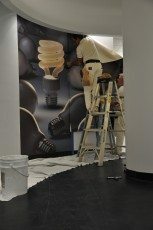 Its unique surface yields excellent imaging quality and is installed with standard wall covering pastes, primers, and techniques. 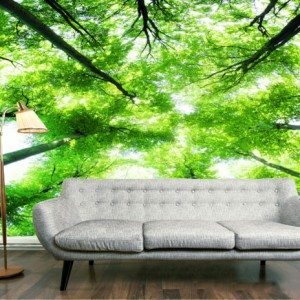 It is a PVC free product made with a polyester/natural fiber technology containing over 31% recycled materials. 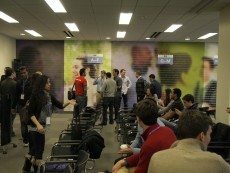 It combines Type II durability and a Class “A” fire rating in a highly breathable, recyclable wallcovering. The highly breathable surface (66 perms) is important because it increases resistance to mold and mildew in high humidity environments. 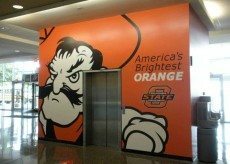 When mural graphics will need to be changed rather than permanently installed this a great choice. 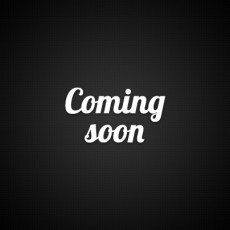 It’s a non-PVC , 6mil, poly-coated fabric, with a high tack removable adhesive that leaves little to no residue when removed. We use our durable UV ink set for printing. 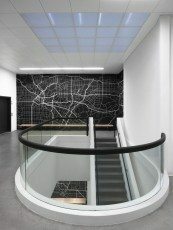 The same material can be contour cut to apply as smaller pieces on adjacent walls or or windows. 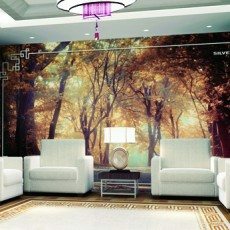 This is a paper based PVC free wall and window-scape medium. The product is available in smooth or textured. With the pre-pasted water activated adhesive it is simple to install and ideal for a variety of wall, window, and rigid surface applications. When styles change, just wet and peel to remove. 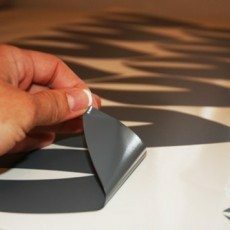 Any adhesive residue is removed with a simple water wash. 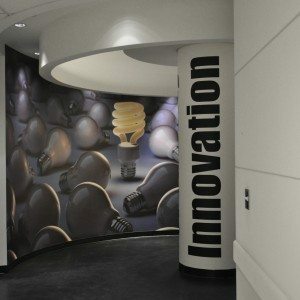 Most commercial grade wallcoverings are quite thick and have a canvas backer for dimensional stability. The reason for the thickness is it helps hide blemishes in the wall surface and also increases durability. 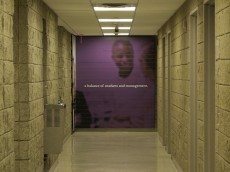 Thinner self-pasted or self-adhesive materials, are less forgiving when wall surfaces are below par. There are also new “Green” non-vinyl coverings to help your project stay on track with its LEED targets. Your Benchmark Rep can help you through the jungle. 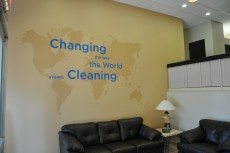 Wall Prep – Walls need to be clean, smooth, and have surface characteristics that optimize the adherence of the paste used to hang the wall covering. 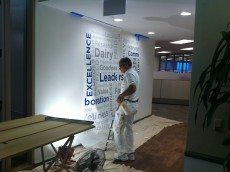 There are some paints used in commercial environments that degrade adherence. The easiest way insure a good install is to prime the wall with Shieldz® Universal Wallcovering Primer. This is a Rustoleum product readily available at retailers. It’s also adds mildew resistance which is important because vinyl coverings actually dry through the wall. 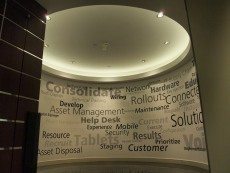 Matched Panels – Installing matched panel graphics isn’t a lot different than working with repeating patterns. If you can do one you can probably master the other. One issue that is a little different is making sure the overall placement on the wall is correct. The first panel up completely dictates the placement of everything to come. 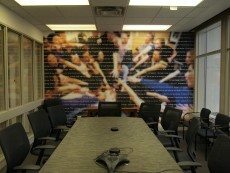 Since the image panels aren’t continuous (like a repeating pattern would be), the top and bottom placement is more critical, and checking verticals against a rise or fall of the horizontal (floor or ceiling) is an extra step that needs to be taken to insure proper placement. If you prefer, Benchmark will handle the installation for you. 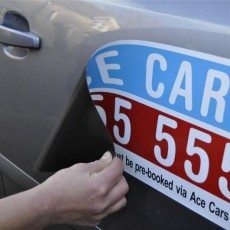 Our installers can get the job done with a minimum of fuss and concerns. 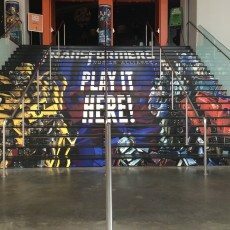 Benchmark installers are also expert with standoffs, individually framed graphics, and lettering installs so you can rely on one source to do it all.